Showing 53 articles from May 7, 2014. 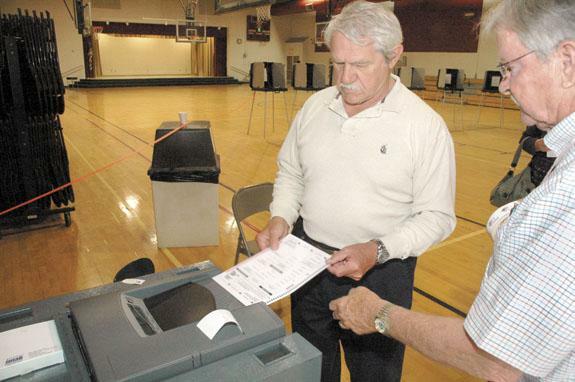 LOUISBURG — Election staff will make results official on May 13, but Tuesday night’s election produced two clear winners in the sheriff’s race and gave an incumbent a slight win, unofficially. Incumbent Sheriff Jerry Jones nabbed the Republican party nomination with 1,964 votes, garnering 54 percent of the vote to beat out challenges from Tom Hawley, 841 votes, William Mitchell, 706 votes, and Rodney Shearin II, 88 votes. A general state-of-the-schools description was outlined by Franklin County Schools Supt. Lisa Martin Tuesday morning at a joint meeting of the Franklin County commissioners and the county school board. She began by detailing the last five years of Franklin County school history on her way to asking the county to increase funding for schools by $1.1 million in the upcoming fiscal year. State Rep. Bobbie Richardson has scheduled a Town Hall meeting on Duke Energy’s coal ash spill. The May 13 event is slated to begin at 6 p.m. in the Cooperative Extension Service building at 103 S. Bickett Boulevard in Louisburg. 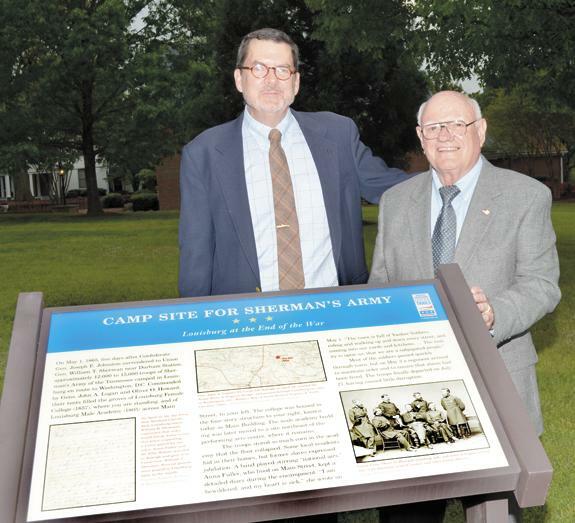 Standing in the center of the Louisburg College campus green last Thursday evening, you could almost imagine hearing weary troopers slogging up the street toward a campsite, a march that symbolized the end of the bloody struggle that was ending 149 years ago — to the day! In May, 1865, troops from General William Sherman’s forces had left Raleigh and were headed to Washington, D.C., on a forced, difficult march in the heat and humidity of early spring days. There is berry good news to report this week — and that’s not a typo! Strawberries have arrived in Franklin County at long last and are the perfect antidote to the long, cold, miserable winter we just endured. This crop is just getting to market — and first indications are that’s is going to be a very good year. If you want better schools, the ball is in your court! Dr. Lisa Martin, who has just completed four short months at the helm of Franklin County schools proved she is a quick study Tuesday morning when she presented a coherent, to-the-point analysis of the state of Franklin County schools and the challenges they face. For most of her presentation, which was heard by four county commissioners and six school board members, she used solid data, not emotion, to make her points. There is always a special sizzle in the air on election day — particularly when local and regional offices (by that, I mean jobs) are on the line. This past Tuesday was no different. As I made my rounds to a few voting sites, parking lots were packed, but no so much with voters. Many of those coveted parking spots were being used by election-day campaigners. Four died at Benghazi; how many died in NC? Like most Americans, I have various roles in life. My favorite is Grandfather. 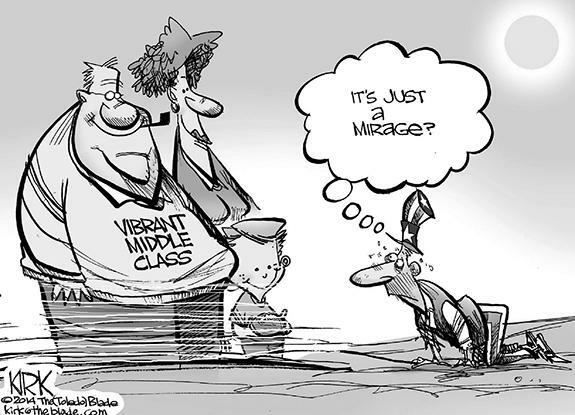 Today’s North Carolina Republicans appear to be on a mission to eradicate the middle class in order to facilitate the flow of wealth to their financiers. Their priorities simply do not represent the interests of the people they were elected to represent. Thank you for letting the residents of Louisburg know about the possible plan to replace the correct and original windows on our magnificent historic courthouse with some sort of alternative. I rarely read the columns of either Steve Trubilla or Larry Marciniak, but my wife handed me the paper open to their page, so I read them last week. Marciniac offered a perspective on early voting, nothing that raised my eyebrow. LOUISBURG —Funeral services for Willie Bell Williams, 76, who died Sunday, May 5, 2014, will be held at 1 p.m. Saturday, May 10, at St. Stephen’s Baptist Church. Burial will follow in the church cemetery. HANNAH HEADS UPFIELD. Franklinton High School soccer standout Hannah Rayman (left) surges into scoring position for the Lady Rams as Bunn’s Jho Salmeron defends during last Friday evening’s Northern Carolina Conference event. FRANKLINTON -- In order to lock down the No. 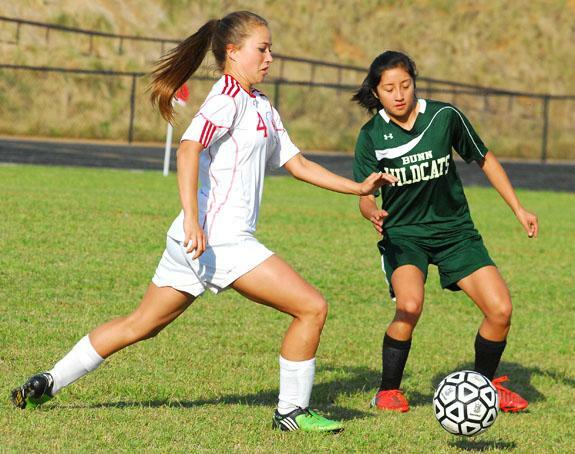 4 position in the competitive Northern Carolina Conference, the Franklinton Lady Rams first needed to work their way through a challenging end-of-season soccer schedule. That surge included a toughie last Friday night against an upset-minded Bunn group at the FHS Football Field. Franklinton had stopped the Ladycats earlier in the year on the road, but the Lady Rams were never able to completely shake off BHS en route to securing a two-goal victory. SEE YA IN GREENSBORO. 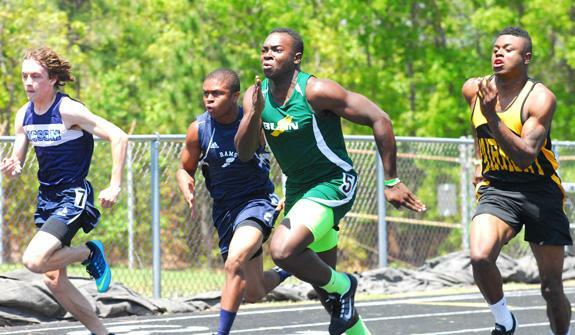 After winning the 100 and 200 at the regionals, Bunn’s Ashton Avery (center) will head to Greensboro this Saturday to take part in the Class 2-A State Track and Field Championships. SOUTHERN PINES -- Both Franklinton and Bunn entered last Saturday’s action at the Class 2-A Mideast Regional Track and Field Championships with Final Four aspirations. Under the format, the Top-Four finishers in each event qualify for the the state meet, which will be held this Saturday at North Carolina A&T State University in Greensboro. TORI’S TIME. 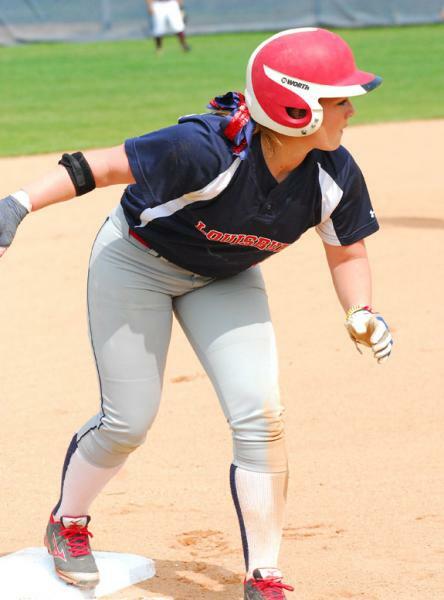 Tori Geissinger enjoyed a strong freshman season as a member of the Louisburg College softball squad under veteran head coach Don Stopa. 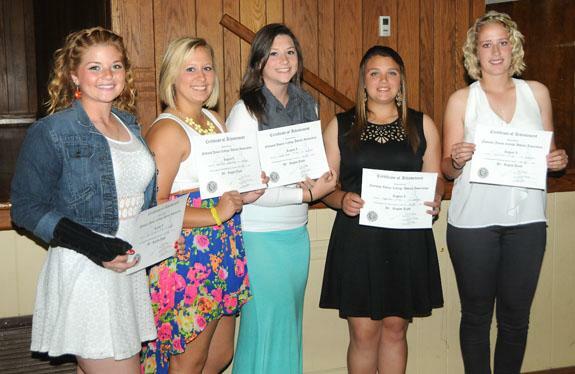 LOUISBURG -- One of the perks of the Region X Softball Tournament is the annual Awards Ceremony, which sees the league’s top standouts honored for their year-long performances. This time around, Louisburg College hosted the tourney, along with the ceremony two weeks ago at the LC Multi-Purpose Center. 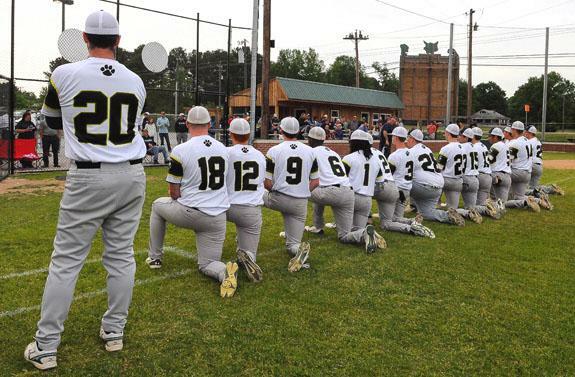 BUNN -- Two games against Southern Vance were all that stood in the way of the Bunn Wildcats claiming another Northern Carolina Conference baseball championship. The Runnin’ Raiders have boasted some quality teams in the past, but they didn’t provide much of a road block for Bunn’s inexorable title march during Monday’s doubleheader. IN THE CLUTCH. 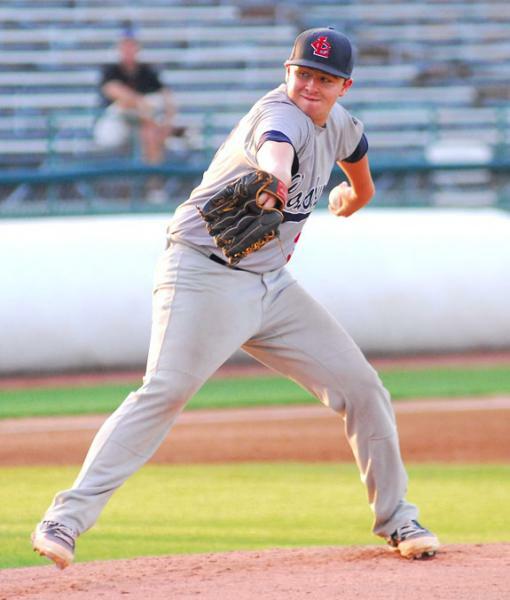 Lefty Daniel Batts pitched well Tuesday night for the Louisburg College baseball squad. KINSTON -- Inevitably, the law of averages tends to even out on the baseball diamond -- regardless of the level. For three monumental games, the Louisburg College Hurricanes came through in the clutch at just about every opportunity -- and that strong work sparked LC’s Cinderella Story run toward the championship round of the Regin X Tournament at Grainger Stadium. LEJEUNE -- Louisburg High School junior Vanisha Wilshire had quite a day for herself last Saturday at the Class 1-A East Regional Track and Field Meet at Lejeune High School in Onslow County. Wilshire will be appearing at the states for the third consecutive year after a standout performance that featured region titles in the discus (99-02), high jump (5-2) and triple jump (35-03.25). CATCH ME IF YOU CAN. Louisburg High School batter Jessie Whitley (left) tries to make it to first base as Granville Central pitcher Taylor Bailey throws for the out during last Friday’s game. 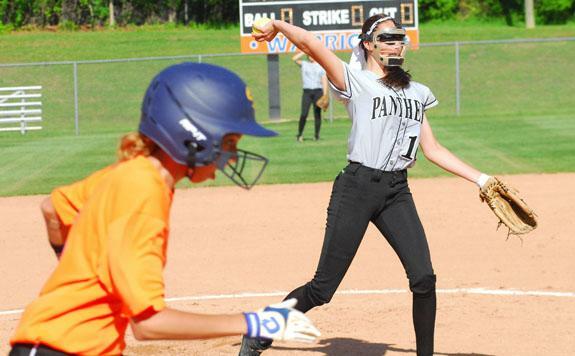 LOUISBURG -- All along, it was expected that Louisburg and Granville Central would be the final two teams standing in the race for the Tar-Roanoke Athletic Conference softball championship. But due to poor weather, the clubs weren’t able to meet until last Friday’s showdown on the LHS campus. With first place in the TRAC at stake, the Lady Panthers earned Round One of the two-game duel with an 8-0 decision. FAIRMONT -- For the second consecutive year, the Bunn Wildcats have qualified for the Class 2-A State Golf Championships. 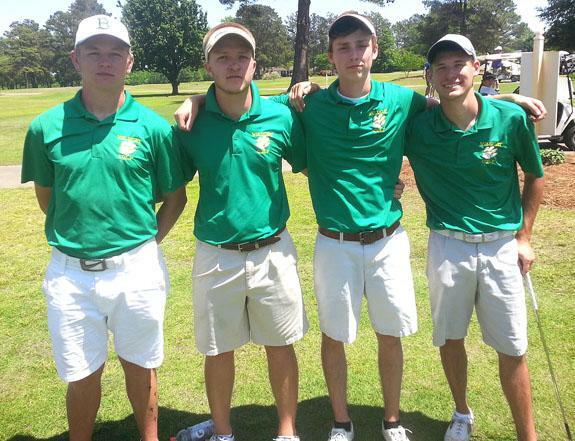 Bunn punched its ticket courtesy of a third-place team performance at Monday’s Class 2-A Mideast Regionals at Fairmont Country Club near the South Carolina border. LOUISBURG -- A relationship that began two years ago will continue for the next pair of seasons at Louisburg College. Back when she was a prep sophomore, Corinth Holders standout Anna Capps attended an Elite Girls Soccer Camp at Elon University -- and was coached by LC skipper Andy Stokes. 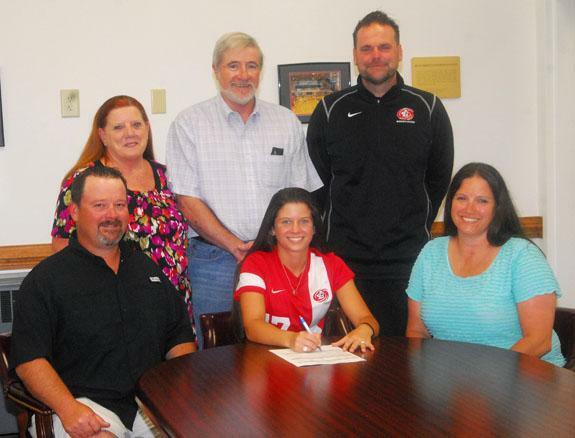 They have remained in touch since then, and Capps signed a letter-of-intent last Thursday to join Stokes’ successful program at Louisburg. LOOKS GOOD. Members of the Bunn High School varsity baseball team look over the new improvements at the field. BUNN -- It literally took a village to help with the upgrades at the Bunn High School Baseball Field. BHS head coach Chris Cullom -- and former skipper Leonard Allen -- went about the process of selling legacy bricks that are now on display at the facility. Over 70 bricks have been sold to boosters and community members. Students at Bunn got involved as Billy Longson’s carpentry class built the sparkling-new concession stand. LYNCHBURG, VA. -- The Carolina Mudcats snuck across the tying run in the ninth and scored twice in the 10th to claim a 5-3 victory over the Lynchburg Hillcats on Tuesday night at Calvin Falwell Field in a Class A Carolina League baseball showdown. The Mudcats (15-13) earned their first overtime win and take the series from the Hillcats (12-17). THE RING’S THE THING. 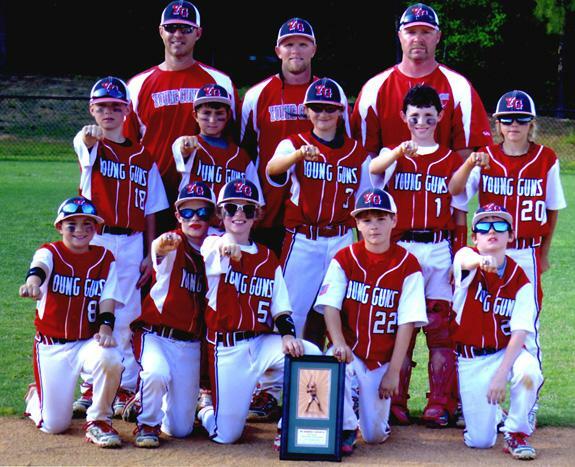 The Franklin County Young Guns Travel Team earned championships rings by finishing in the gold bracket of the AAU Ring Showdown 10-Under Baseball Tournament, which was held recently in Oxford. 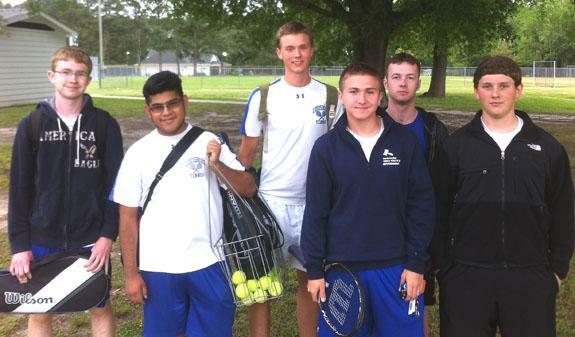 Pictured are (back, l to r) Coaches John Canaday, Jamie Wilson and John Garrett; (middle, l to r) Fisher Canaday, Kyle Herrmann, Nick Moran, Parker Southall and Alex Douglas; (front, l to r) Gavin Johnson, Trenton Wilson, Shane Garrett, Landon Mize and Brandon Moran. 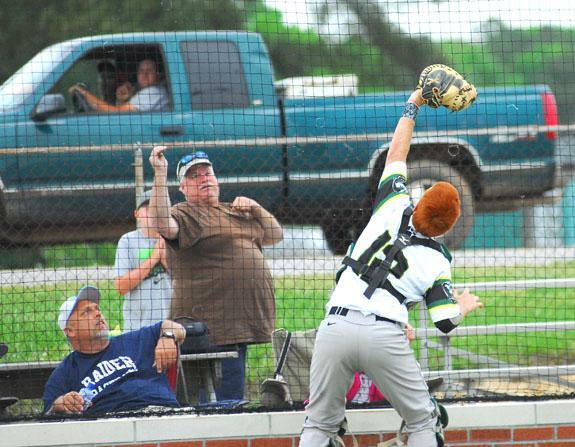 Even the person driving by in the truck caught a glimpse of Bunn’s Josh Boone hauling in this foul ball during Monday’s home doubleheader. 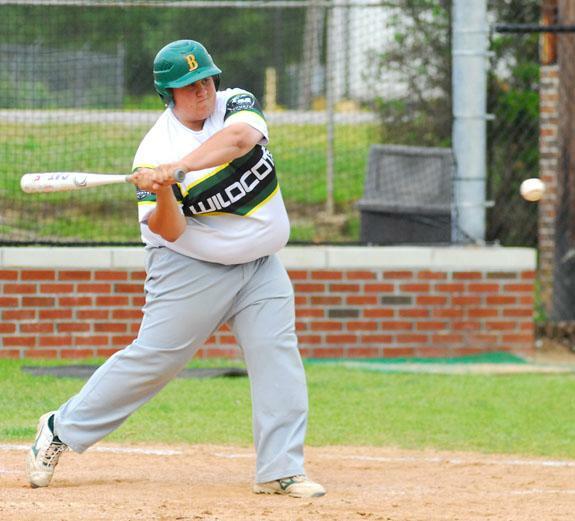 Bunn’s Braxton Oliver rips a two-bagger. 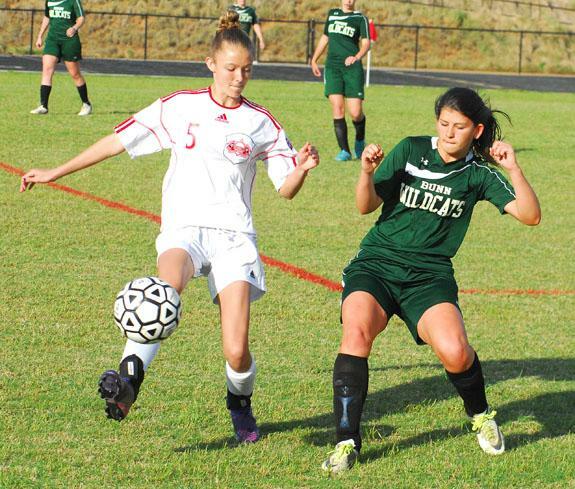 Franklinton’s Sydney Rednour (left) sends the ball upfield as Bunn’s Jaden Richards defends last Friday night. 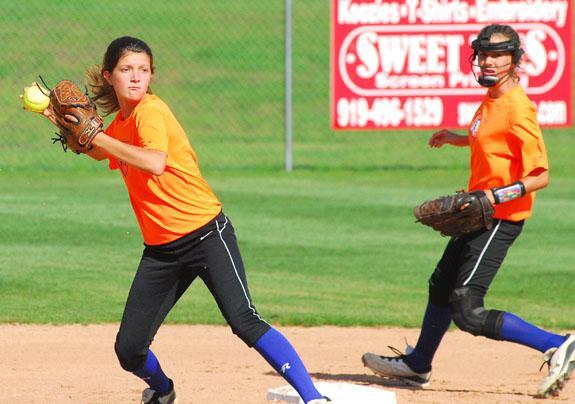 Louisburg High School shortstop Mackenzie Wood (left) makes a play during the Lady Warriors’ home softball matchup last Friday against conference foe Granville Central. 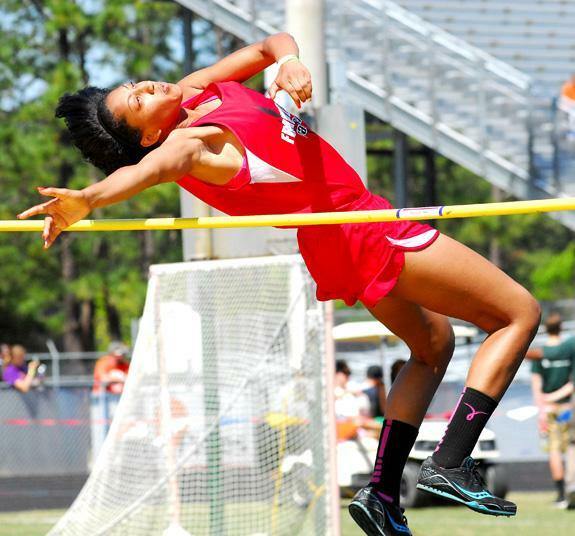 Following her second-place effort in the Girls High Jump, Franklinton’s Charity Snelling will participate in the Class 2-A State Track and Field Championships this Friday. 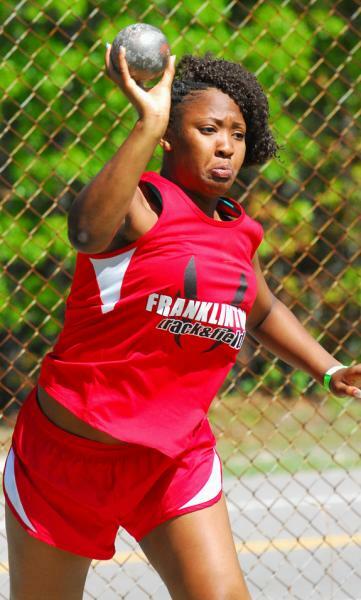 Franklinton’s Diesha Davis heaves the shot put last Saturday. 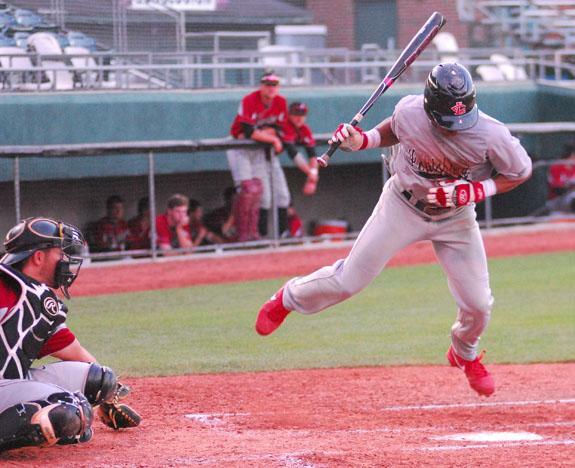 Louisburg College’s Markel Jones (batting) elevates to avoid a pitch during Tuesday night’s action at the Region X Baseball Tournament at Grainger Stadium in Kinston. Louisburg College players who earned All-Region X Softball Team accolades this season were (l to r) Tori Geissinger, Kim Mobley, Jennifer Allison, Megon Smith and Sierra McLaren. 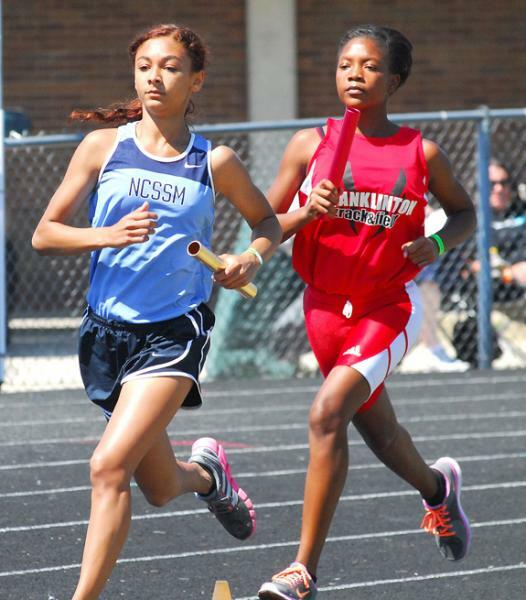 Franklinton’s Tykima Alston (right) trails a North Carolina School of Science and Math runner as part of the Girls 3200 Relay last Saturday. 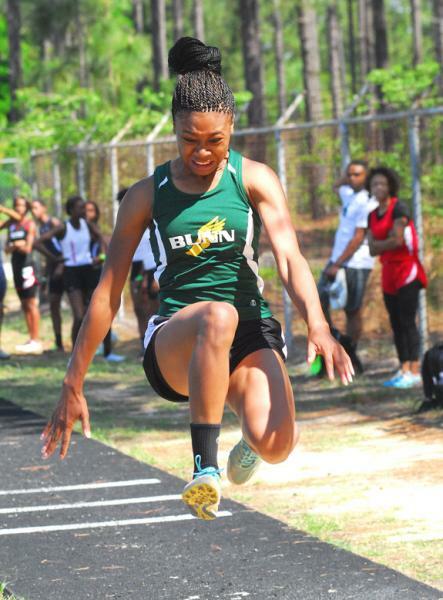 Bunn’s Tainasha Vines took first place in the Girls Triple Jump and Long Jump at last Saturday’s Class 2-A Mideast Regional Track and Field Championships. 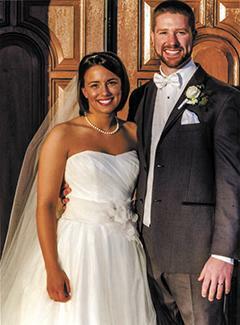 Courtney Blaire Peoples and Landon Joseph Vick were married on March 8, 2014 during a 4:30 p.m. ceremony at Woodland Baptist Church in Wake Forest. The double-ring ceremony was officiated by the Rev. Jimmy Scott, uncle of the bride. The bride is the daughter of Eddie Peoples of Franklinton and Janice Peoples of Franklinton. When you call her phone number, expect to get her voice mail. She might be in a water aerobics class, helping with a canned food drive, tutoring a child, or meeting with her computer club. In fact, Mary is more active today then she has ever been, and she is 75 years old. How is she aging with such gusto? According to Mary, three key factors are diet, exercise and attitude. It’s a habit. 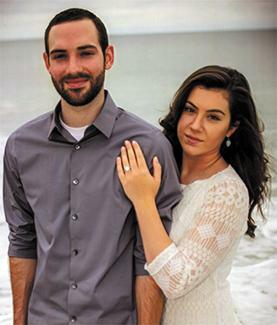 Al and Melinda Parham of Oxford announce the engagement of their daughter, Allison Nicole Parham to Michael Kai Lucas of Garner. The groom-elect is the son of Scott Lucas of Fuquay-Varina and Robin Lucas of Louisburg. The couple have planned a September 2014 wedding. These are the happy winners at a pageant held May 3 at Bunn Middle School. 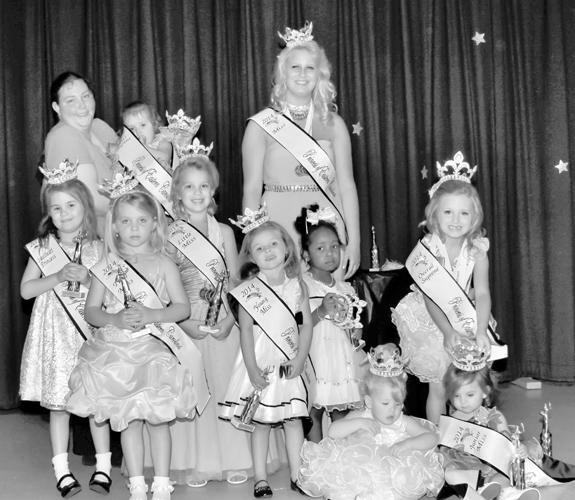 In the front row are Tiny Miss Brianna Perry, Young Miss Lexi Holland, Wee Miss Randi Arrington, Baby Miss McKenna Cooper; Junior Miss Peyton Baines and Overall Supreme Miss Morgan Phillips. In the middle row are Sweetheart Aubry O’Quinn and Little Miss True Carmichael. In the back row is Mini Supreme Azura McPherson who is held by her mother, Alisson Ennett. An article in the Aug. 5, 1857, issue of The Weekly Raleigh Register announced the opening of Louisburg Female College. The Youngsville Woman’s Club awarded its annual $500 scholarship to David Denton of Louisburg. 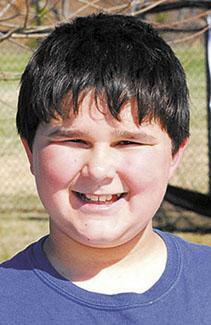 He is the son of Mr. and Mrs. Carey Denton. 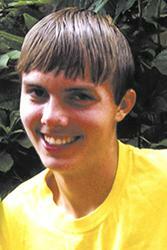 He plans to attend N.C. State University to pursue a degree in horticulture. 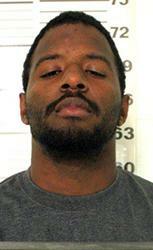 He is currently taking some classes there, but will be a full-time student in the fall. Vance-Granville Community College will hold a series of sessions offering information for high school students and their parents on the “Career and College Promise” (CCP) program. CCP allows eligible students to pursue a college degree, diploma or certificate while still in high school, without having to pay college tuition. Above, Justin Magee, right, makes sure his name is pronounced correctly during rehearsals. 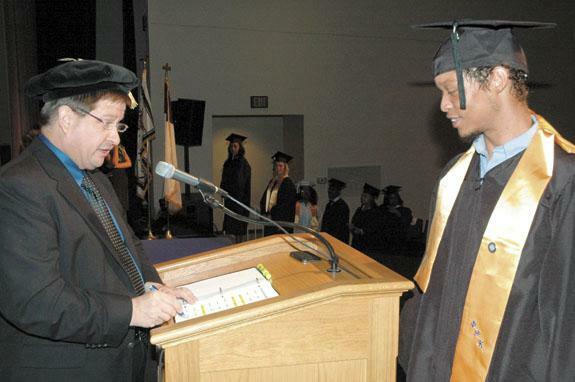 During the ceremony, 105 graduates received their degrees. LOUISBURG — Franklin County commissioners agreed to pay $300,000 to upgrade the jail’s equipment and kitchen. The agreement comes on top of a decision back in September to spend $3.6 million to put a new roof on the jail and bolster other areas that deteriorated because of water leaks. County staff said the kitchen equipment was not included in the overall bidded out project because the mechanism to purchase equipment would save the county 20 to 30 percent. FRANKLINTON — Almost two years after a bitter dispute over water ended in superior court, town and county staffs are looking at becoming partners again. County staff say it’s an opportunity to explore options for a precious commodity. 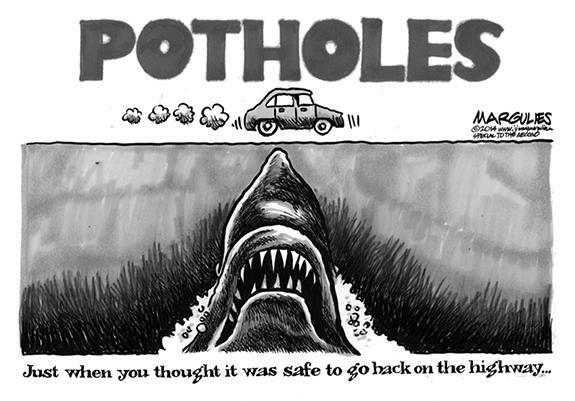 Town staff and officials say it’s a chance to bolster their bottom line. LOUISBURG — Franklin County sheriff’s deputies arrested three people and are preparing to take another into custody on kidnapping and assault charges related to a home invasion. Jeremy Wright, 22, Kyle Anthony Clark, 19, and Darius Revel Robinson, 22, all of Louisburg, were charged with first degree burglary, assault with a deadly weapon, conspiracy to commit robbery with a dangerous weapon, two counts of second degree kidnapping and felony larceny related to the March 15 incident in the Gold Sand community. 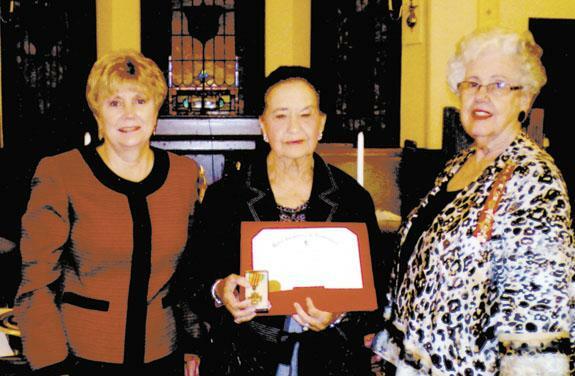 The Joseph J. Davis Chapter 537 of the United Daughters of the Confederacy held a Ceremony of Bestowal of Military Awards on Saturday, April 12, at Maple Springs Baptist Church in Louisburg. A Vietnam Conflict Medal was awarded to John Rickey Edwards (posthumously), Specialist E 5 United States Army, Third US Army (USARPAC). USDA North Carolina Farm Service Agency (FSA) Executive Director, Bob Etheridge, announced that, effective April 15, 2014, orchardists and nursery tree growers who experienced losses from natural disasters that occurred on or after Oct. 1, 2011, can sign up for the Tree Assistance Program (TAP). TAP was authorized by the Agricultural Act of 2014 as a permanent disaster program. WASHINGTON—Agriculture Secretary Tom Vilsack announced that, effective April 15, eligible farmers and ranchers can sign up for U.S. Department of Agriculture (USDA) disaster assistance programs restored by passage of the 2014 Farm Bill. “We implemented these programs in record time and kept our commitment to begin sign-up today,” Vilsack said. 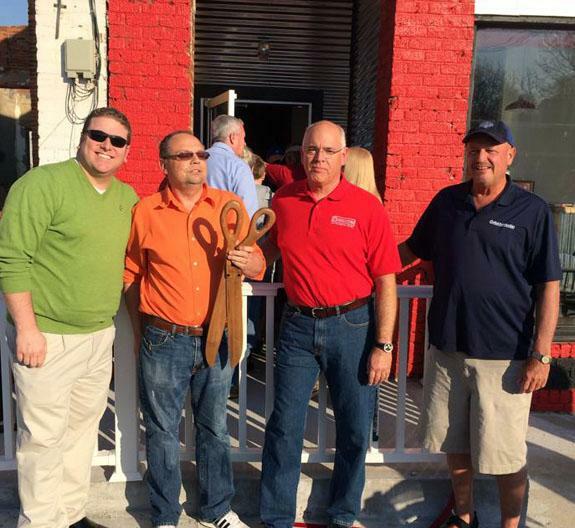 Johnny Wayne Mitchell, second from left, opened Johnny’s on Main with the aid of, from left, Mayor Elic Senter and fellow Commissioners John Allers and Art Wright. The business in downtown Franklinton on Main Street features a bar and grill.